Due to popular request, per-user licenses are now available for EasySMF. You can now buy a license by the number of users, instead of the number of LPARs. The per-user license can be used for any number of LPARs. The previous per-LPAR license which allows any number of users is still available, now referred to as a Site License. The Personal License, which was only valid for the person named in the license, has been replaced by a 1 user license which is not tied to a specific person. User licenses are available singly, or in discounted packs of 5 or 10 licenses. Single licenses cost $595 per user, 5 user packs are $2,295 and 10 user packs are $3,895 for a 12 month license. Prices are in US dollars. You might have batch service classes in Workload Manager with multiple periods. Service class periods allow you to use different goals for small and large jobs, without knowing in advance whether any particular job is small or large. The difficult question is: Where do you set the boundary between small and large jobs i.e. the duration of first period? That is what the Workload Manager – Service Class Job Size report shows you. 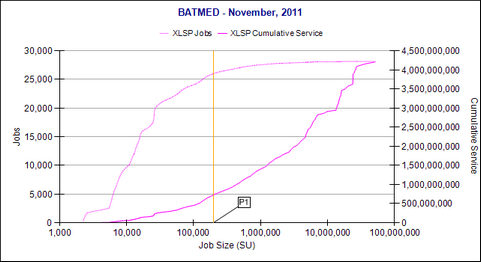 It plots the cumulative number of jobs and cumulative service versus the size of the job. 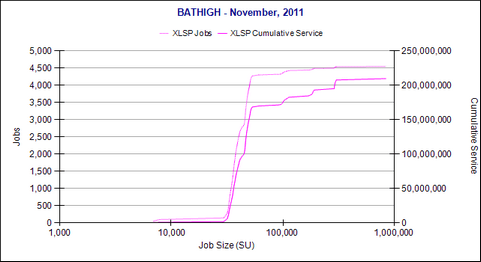 You can then see how many jobs of a particular size you have, and how much service they consumed in total. Typically, you want to set the duration of first period so that the many, small jobs that together use very little service are separated from the fewer, large jobs that consume most of the service in the service class. The second chart shows a service class where the period 1 duration appears too short. Very few jobs actually finish in period 1 and it accounts for an insignificant percentage of service. The period 2 goals will have most influence on how long the jobs take to run. Period 1 is just an additional service class period for WLM to manage, with very little benefit. If multiple periods are appropriate for this service class, a duration somewhere between 10,000 and 1,000,000 looks reasonable for period 1 – again a wide range of values would give similar results. The actual value would depend on whether you preferred the medium size jobs to run in period 1 or period 2. The shape of the completions and service lines, with the sharp rise in completions before 10,000 SUs means there could even be an argument for 3 periods, with period 1 duration of 10,000 and period 2 duration of 1,000,000. This could be justified if the jobs between 10,000 and 1,000,000 SUs were different enough from the larger and smaller jobs that they shouldn’t be included with either. The third example is a service class without an obvious divide between small jobs and large jobs. 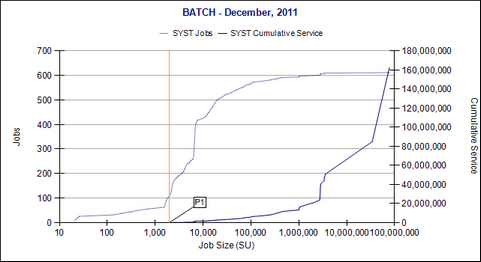 The cumulative service line follows the job count line fairly closely, suggesting the jobs are a fairly regular size. It probably doesn’t make sense to try to apply multiple periods to these jobs. If the original 30 day evaluation period has expired but you have not purchased a license, a new release will now allow an additional 7 day evaluation period. This is to allow new features and fixes to be evaluated. If the standard evaluation periods are insufficient, please contact info@blackhillsoftware.com for a temporary key.